Although it was a Sunday, it was a busy day for us Blockheads. This year Tetsu and I are block leaders (known as Blockheads in my book.) This means we pass around city notices to the other 6 families on our block, we collect homeowners dues and we attend monthly homeowner meetings. As a united block activity we all clean the neighborhood streets and encroaching forest twice a year and clean the community center once a year. 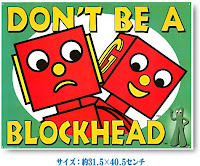 Scheduling is all up to the Blockhead. Tetsu sent out a notice to our block earlier this month announcing community center cleanup day. Early yesterday morning (Cleanup Day!) I made chocolate chip cookies and brought out paper cups and bottled sports drinks. We are ready to lead our block in some positive united community service! BUT as everyone (6 of us) gathered at the community center Tetsu and I realized we didn't have the center's key!!! We both just assumed that the key was connected to the community center scheduling board that we had been given (and didn't check ahead of time). Major error on our part!!! With many apologies we sent everyone else home with cookies, went searching for the person with the keys and then cleaned the community center ourselves. So much for positive united community service. And that's just THIS month!! !